Soya mince is a great source of protein and is low in calories. Combined with any other vegetable this becomes a complete one pot dish. Some people do not like soya mince as they say it has a strange smell. I guess a little technique is used to make this. I always get compliments for my soya mince and I think the way i cook it has a lot to do with it. 1 cup of soya mince granules, soaked in 2-3 cups of water. Soak the soya granules in 2 cups of water for about half an hour while you chop everything for the recipe. If the granules absorb all the water add some more till it just about covers it without getting absorbed. I use bottled water for this. Brown the onions in oil till really well browned and then add the ginger garlic paste and cook for a few minutes more. When nice and brown add the soaked soya mince with the water and cook it with the browned onions for about 10 minutes stirring on and off till the soya mince has changed color and is browned. Add the garam masala and the mushrooms and tomatoes and cook till the tomatoes soften. Add the green chillies, salt and the coriander leaves and give it a good stir. If you want it with a little gravy add some water and bring it to a boil. If you want it dry then its ready to be eaten. You can also add some ground black pepper and some lemon juice to this. This can be used for samosa filling, for filling for lasagne by adding a few italian herbs and oregano. This can be also used as grilled sandwich filling etc. If the texture of the mince you get is too thick you can just mince it a bit in the blender. 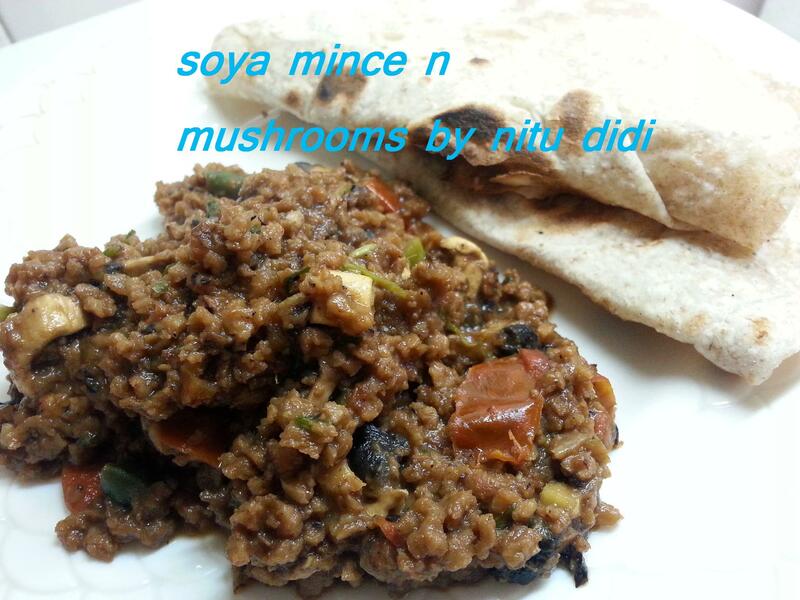 This entry was posted in Everything Vegetarian, Fusion, Gluten Free, Healthy Options, Low Cost, Magic Bullet, Nitu´s Spicy Delights, Uncategorized, Veg Starters, Vegan and tagged soya granules, soya mince, veg kheema, Vegan, vegetarian. Bookmark the permalink.